Stop Letting Israel Dictate Your Vote! Hello from Canada! I am a non-Jew who married into a Jewish family whom I adore and, from what I gather, adores me too. As such, we talk about everything, including, gasp, politics and religion. My mother-in-law and I recently got into it because she is planning on voting for Conservative Stephen Harper for Prime Minister in our upcoming elections because, nearly exclusively, of his stance on Israel. Otherwise, he doesn’t really represent her mostly progressive beliefs — something she readily admits. Seesaw, as a non-Jew I must confess that I really don’t understand this. My question, should a non-Jewish son-in-law try to convince his Jewish mother-in-law to not let Israel factor so heavily in her ballot decisions? Is doing so just crossing the line? Even though your candidate won — Mazel Tov! — here are some thoughts on how to deal with this situation when it comes up again. And it probably will. The relationship between Jews and Israel is complex, to put it mildly. Perhaps you can ask your mother-in-law to explain what about Harper’s stance on Israel is so powerful to her and why. Perhaps you can ask your spouse what his or her own relationship to Israel is. I believe that this will help you understand your mother-in-law’s perspective more, and will ultimately lead to more productive conversations that may help her understand your point of view better too. 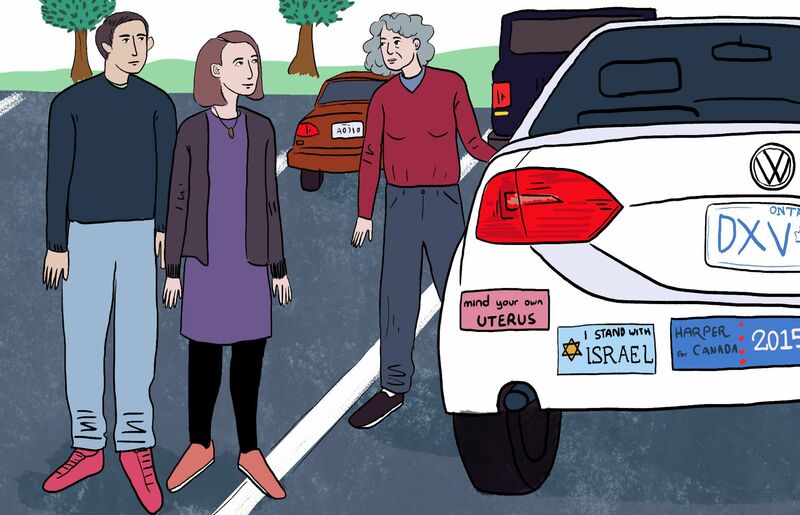 But if there’s anything as complex as the relationship between Jews and Israel, it’s the relationship between interfaith in-laws and extended family. So while I encourage you to ask them about their feelings on Israel, please don’t try to convince your in-laws that they’re wrong. This is a stance grounded in their personal relationship to history, community, religion and probably even fear. If your spouse wants to argue with his or her parents about Israel being such a huge part of their decision-making, that’s ok (even good!). It’s his or her mom. But for you, this isn’t necessarily about Jewish or not-Jewish, or pro-Israel or anti-Israel, this is about living with your in-laws. Overall, it’s not really worth putting too much energy into political debates with those you plan to know for the rest of your life. Now, arguing about politics with new people who aren’t related to your spouse? That’s another topic. Rebecca Lehrer is the Co-Founder and CEO of The Mash-Up Americans, a website and consultancy representing the hybrid culture and new face of America. The Mash-Up Americans is exploring Spanglish, kimchi + more, just not on Shabbos.